A Henderson father is mad his 6th grader was told he can't have his bulletproof backpack in the classroom due to school policy. A Henderson father is upset after he says his son's school won't let him have his bulletproof backpack in the classroom. 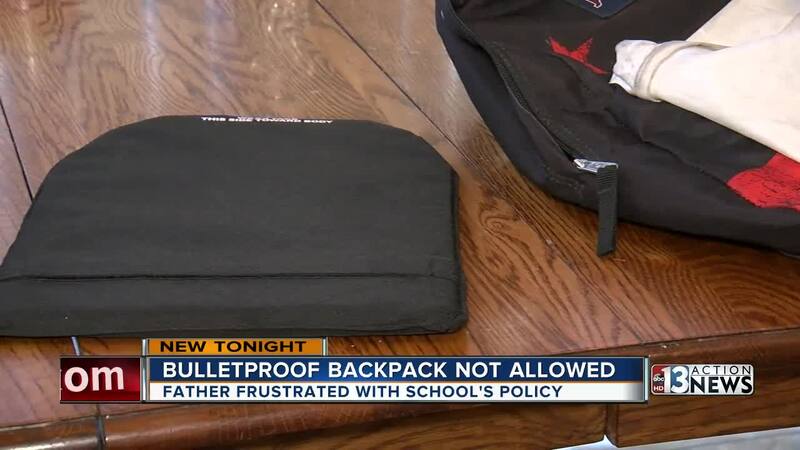 Steven, who doesn't want his last name used, bought all four of his school-aged kids bullet proof inserts for their backpacks on the first day of school after he learned a student brought a loaded gun to a high school down the street. "I told them hey, your teachers are going to tell you to go ahead and put the backpacks up in a locker and you tell them, politely, no." Steven says his high school senior had no problems. His 7th grade son and 6th grade daughter also had no issues after a quick phone call with the school administration. But it was a different story with his 6th grade son at Burkholder Middle School. "The Dean said well this is just not going to work." Steven also talked to the principal of the school who explained each CCSD school has a different backpack policy. Steven says he was told his son would be written up if he continued to bring his backpack into the classroom instead of keeping it in the locker. "At the end of the day, write-ups don't kill but bullets do so we will go with the write-ups." Steven wants all four of his kids to be able to keep their backpacks with them at all times in case of an emergency. "Anything that gives them a little bit of a better advantage to beat the odds," he said. "Worst case scenario, no one ever wishes that on their kids and I don't think any of the parents that have been involved in school shootings have ever thought that this could be a possibility."